Following on from my first successful skirt, I've enjoyed wearing it this week. Especially as all my shorts have got a little on the large side recently, and I don't want to wear trousers at the moment. Actually, let's talk about that. I am brunette. I stopped wearing shorts and skirts so much because I had a lot of thick, dark leg hair, and the shaving and fretting about that had really kind of got to me. I know you're supposed to be all feminist and "I don't care" about these things, but I did care. So a couple of years ago I paid for laser hair removal treatment. It wasn't cheap, but it is the best money I think I've ever spent. I still have some leg hair, but it's fair. I go a couple of months between giving it a bit of a mow over with an epilady, and can entirely ignore it in between. Huge difference to shaving daily/ever other day! It has honestly made such a difference to my outlook. So much happier to throw a pair of shorts or a skirt on, and just loving it. So anyway. 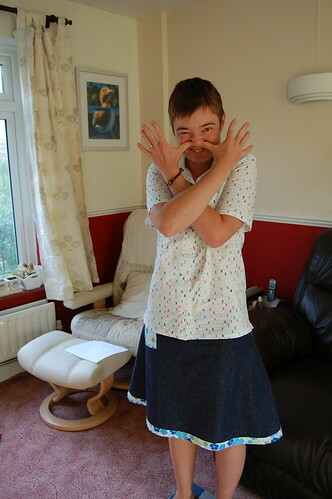 I decided another skirt was in order, and I pretty much knocked this one up on Friday night. Sort of used this tutorial, I used the template I used for the hippo skirt and pulled it in a little at the waist, and reduced the flare a little. 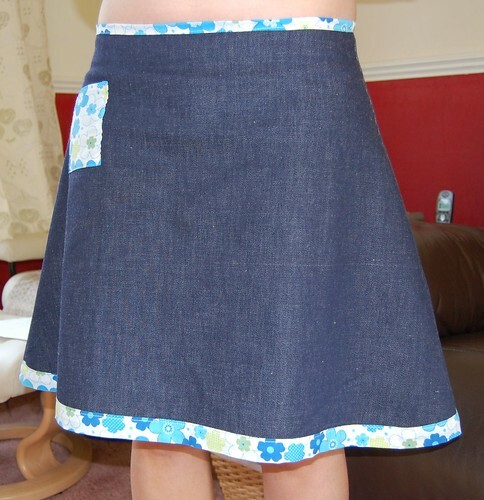 The fabric is some denim that my mum gave me (she's having a clear-out), and the edging is some left-over fabric from the first shirt I made. (Hm. Doesn't look like I ever blogged that. Whoops!) I've added a small pocket. It's perfectly iPod sized. I listen a lot while I'm working, and standing just makes it easier to put the iPod in the pocket. 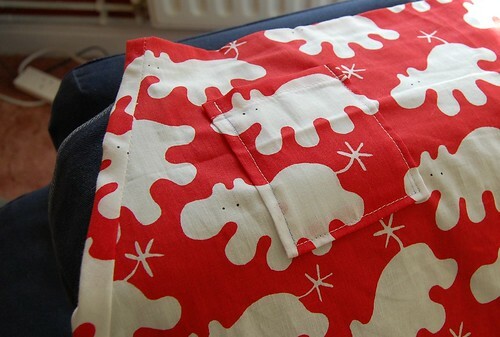 In fact, I missed the pocket so much, I added one to the hippo skirt too. I tried to match the pattern to make it almost invisible. Quite a different approach to the denim one! They are very easy skirts to wear. Really I ought to get the hang of zips, but I just pull them on over my head. The other project I've had on the go is a shirt. I bought some fabric designed by Emma McCann on Spoonflower. I thought it would make a fabulously geeky shirt. I actually bought the fabric ages ago, but I was a bit scared. 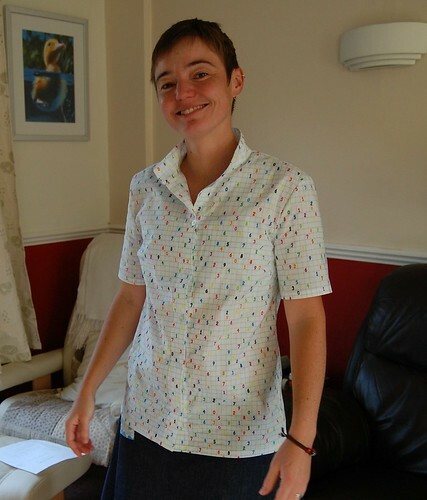 I'm not ever so confident with the sewing machine yet (although I'm getting more so), so I got some cheap, silly fabric (see the trim above), bought Burda pattern 8153 and had a practice run. Collars are fun. So are sleeves. I wussed out of doing buttons though - went with poppers. Then I kind of ran out of time for about a year! So I almost forgot all the problems by the time I got back to it. I'm pretty happy with the result though. (I sort of wish I'd brushed my hair. Oh well.) I didn't do a full collar on this one. I didn't think I needed it really. I also didn't go for any interfacing. I did short sleeves, and I added just a little bit across the chest. But get this! I did buttons! I sat down with my manual and the interwebs, and worked out how to get a reasonably even buttonhole. Only problem is I did them across the button band, rather than along it. I don't think it makes much difference, but the positioning of the buttons has to be that bit more precise to get the button band to sit correctly. I think if I make another shirt I'll take a couple of inches off the bottom, and possibly make the sleeves another inch shorter. I might put an edge on the sleeves too, rather than a flat hem. I have to say though, I think I could get quite into this sewing lark. More fun than shopping!